THE “SWITCHBLADE”–AUTO, AIRPLANE, OR BOTH? The concept of an automobile that can be transformed into an airplane (or vice versa) has run rampant through the dreams of creative engineers for more than a half century. A few of them got airborne (briefly) but any attempt to mass-market these crossbreed contraptions was unsuccessful. However, the creative and entrepreneurial spirit is once again taking off. The Switchblade flying car is being designed by Samson Motors. I was selling and signing copies of the The Rogue Aviator at last weekend’s US Sport Aviation Expo at Sebring, Florida when I noticed a large crowd gathering at a neighboring vendor. 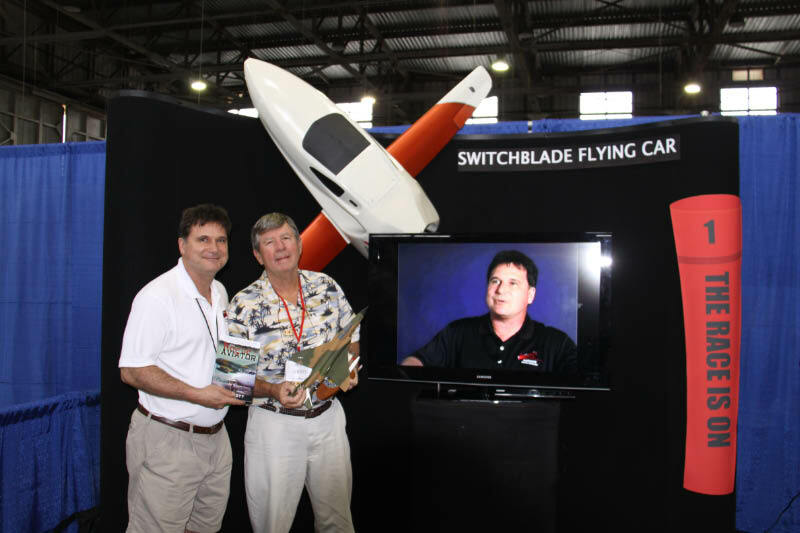 When I wandered over to the area I soon learned about this innovative, revolutionary ground or air transportation device called the Switchblade. It is very simply, a space-age, rocket ship look-alike that can be driven as an automobile and flown as an airplane. The vendor, Samson Motors, owned and operated by Samson Bousfield was hosting media folks and the entire area was abuzz with gawking aviation enthusiasts. Pilots who are anxious to fly/drive this unique air machine were at the controls of the Switchblade simulator. It was a joyous festive atmosphere as the crowd embraced the beautiful design of this multifaceted transportation device while the Switchblade marketing experts drummed up enthusiasm for customers to place a deposit for their own air/road machine. The Switchblade is a kit design, but it does not require advanced mechanical or engineering skills to complete. The projected cost of the kit is $60,000. A nominal deposit of $2,000 will get you into the rapidly-growing que for ownership of a Switchblade. The basic operating parameters are as follows: the maximum airborne speed is 190 miles an hour; normal cruise is 160 mph. In the road-mode it can accelerate to 100 miles an hour. As a two passenger airplane its maximum range is 400 miles. For additional information, the company website is http://www.samsonmotorworks.com/switchblade and Wikipedia also provides a factual discussion of this projected revolutionary transportation device. Along with its versatility it displays stunningly sensual design lines— its aesthetic appeal alone justifies having one parked in your driveway. This blog is prepared by Allen Morris/aka Ace Abbott, a retired commercial pilot and author of two books, The Rogue Aviator: In the Back Alleys of Aviation (www.therogueaviator.com) and Dead tired: Pilot Fatigue-Aviation’s Insidious Killer (www.deadtiredpilots.com).